Click on the image below to read SAF news from December 2013. 1. Approve the reports of the Board of Directors and the Supervisory Council for financial year 2012/2013. 2. Approve the annual report and consolidated report of “SAF Tehnika” JSC and release the Board of Directors from responsibility for financial year 2012/2013. 3. Cover the losses of the “SAF Tehnika” JSC incurred in financial year 2012/2013 in amount of LVL 14’571 (fourteen thousand five hundred seventy one Latvia Lats ) by retained earnings from previous periods. Retain the part of undivided profit from previous periods in amount of LVL 2’221’583 (two million two hundred twenty one thousand five hundred eighty three Latvia Lats) as retained earnings. 4. Appoint KPMG Baltics SIA as the auditor of the “SAF Tehnika” JSC for the financial year 2013/2014 and determine the maximum remuneration for the auditor of the Annual Reports for the financial year 2013/2014 in the amount of EUR 10’100 (ten thousand one hundred EUR), not including taxes provided by the legislative acts. Authorize the Board to sign the contract with the elected auditor for audit of the Annual Reports of „SAF Tehnika” JSC for the financial year 2013/2014. According to the agreement No. L-ĀTA-13-1718 (project No. ĀTA/2.3.1.1.1./13/54/036) concluded on between „SAF Tehnika” JSC and government institution „The Investment and Development Agency of Latvia” of a project „Participation of „SAF Tehnika” JSC in international exhibitions”, on November 11-13, 2013 the company exhibited at “AfricaCom 2013” which took place in Cape Town, South Africa. During the exhibition SAF Tehnika presented FreeMile, Lumina, Integra and Spectrum Compact product lines. The biggest interest from visitors was shown about CFIP Lumina and FreeMile 5.8. Visitors of „SAF Tehnika” stand were mainly from Africa’s southern region countries. Draft resolutions of ordinary shareholder's meeting on 29th of November of SAF Tehnika JSC can be found in pdf document seen below. The „SAF Tehnika” Group’s non-audited net sales for the first quarter of financial year 2013/14 were 2.34 million LVL (3.41 million EUR), increasing by 25% compared to the first quarter of the previous financial year and being by 9% higher than sales in the previous quarter - Q4 of FY 2012/2013. Comparing sales results with the first quarter of the financial year 2012/2013, substantial sales increase (by 60%) was achieved in Europe, CIS region where the Group has stable, local partner network supported, customer base and demand for almost all products from Group’s portfolio. Sales in Asia Pacific, Africa, Middle East increased by 27% showing growing trend already fifth quarter in a row, but results from the Americas were on the same level as year before, but lower than in previous quarters as deliveries of some large orders have been postponed to next quarter due to delays in project realization on customers side. The consolidated net profit of the Group for the first quarter of 2013/14 financial year was 91 thousand LVL (130 thousand EUR), which represents an increase of 212 thousand LVL (301 thousand EUR), compared with the same quarter in the previous financial year. In 2013/2014 there are no changes in the Group’s main focus on developing the Integra product line and working on specific niche products with the goal to satisfy ever increasing demand for efficient, qualitative, price attractive, high capacity data transmission products in the wide frequency range. The Group has set tasks to enlarge customer base and regain higher sales and profitability levels. The Group remains financially stable and with positive outlook for the next operating periods, however the Board of the Group avoids giving any forward-looking sales and financial result statements. Click on the image below to read SAF news in November 2013. AS „SAF Tehnika” informs that on 28th October 2013 it has received 2 announcements from private person Ivars Senbergs. The announcement dated 04.02.2013 informs that Ivars Senbergs has increased his holding in AS „SAF Tehnika” share capital on 4 February, 2013 by purchasing additional shares of AS „SAF Tehnika”, keeping in possession 156558 or 5.27% of AS „SAF Tehnika” share capital. The announcement dated 6 September, 2013 informs that Ivars Senbergs has lost his holding of 5.27% (156556 shares) in AS”SAF Tehnika” share capital on 4 September, 2013. SAF Tehnika” publishes its audited consolidated and non consolidated financial statements for financial year 2012/2013 according to Section 56th, 5th paragraph of „Law on the Financial Instruments Market”. Net turnover of the “SAF Tehnika” Group which consists of SAF Tehnika AS (hereinafter – the Parent) operating from Riga, Latvia, a wholly owned subsidiary “SAF North America LLC” and a joint-venture company “SAF Services LLC” where the Parent holds 50% of the company’s shares, in the 2012/ 2013 financial year was LVL 9.38 million (EUR 13.34 million) which represents a decrease by 3% comparing to the previous financial year. While the reporting year can be characterized by increasing global competition between producers of microwave transmission equipment, the Group managed to keep its customer base, meanwhile also attracting new customers by offering products according to market demands and highest quality standards. In addition, the Group developed customized solutions for particular client needs and provided support during installation and commissioning stages. Delays in the Group’s supply chain and customer payments forced certain shipments to be put on hold, thus, affecting expected sales result. Export represented 98.41% of turnover amounting to LVL 9.23 million (EUR 13.13 million). During the reporting period the products of the Group were exported to 86 countries in the world. “SAF Tehnika” has retained financial stability. The audited net cash flow of the Group for 12 months was positive and amounted to LVL 646 thousand (EUR 919 thousand). During the reporting year the Group made investments in the amount of LVL 342 thousand (EUR 487 thousand) to acquire property, plant and equipment such as IT infrastructure, production and research equipment, as well as software and other licenses in order to improve manufacturing, R&D, testing and other company-wide processes. In addition Group invested in products certification. The Group’s financial result of 2012/ 2013 was a loss of LVL 30 thousand (EUR 42 thousand). The Parent company’s financial result for 2012/2013 was a loss of LVL 15 thousand (EUR 21 thousand). The main difference between Consolidated Interim Report for financial year 2012/2013 (published on 14/08/2013) and audited consolidated Financial statement was due to corrections in income recognition for salescases where significant risks connected with ownership and compensation for equipment sold according to Incoterms delivery conditions were transferred to a customer after end of financial year. The impact of this change was decrease in annual turnover by 164 thousand LVL (233 thousand EUR) which will be recognized in turnover of the first quarter of financial year 2013/2014 as well as respective change in expenses part and net result. According to the agreement No. L-ĀTA-13-1718 (project No. ĀTA/2.3.1.1.1./13/54/036) concluded on between „SAF Tehnika” JSC and government institution „The Investment and Development Agency of Latvia” of a project „Participation of „SAF Tehnika” JSC in international exhibitions”, On October 14-18, 2013 the company exhibited at “WISPAPALOOZA” which took place in Las Vegas, USA. 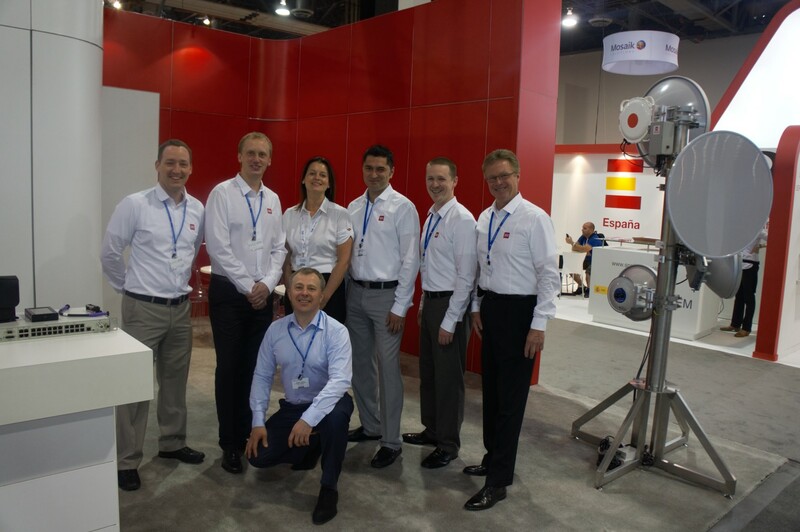 During the exhibition „WISPAPALOOZA” there were presented Integra, Spectrum Compact and Lumina product lines. Visitors of „SAF Tehnika” stand were mainly from different regions of USA and the main interest was about our newest product Integra. According to the agreement No. L-ĀTA-13-1718 (project No. ĀTA/2.3.1.1.1./13/54/036) concluded on between „SAF Tehnika” JSC and government institution „The Investment and Development Agency of Latvia” of a project „Participation of „SAF Tehnika” JSC in international exhibitions”, On October 14-15, 2013 the company exhibited at “CNX7” which took place in Frankfurt, Germany. During the exhibition „CNX7” SAF presented SAF Services brand. Visitors of „SAF Tehnika” stand were mainly from Germany. During the exhibition SAF Tehnika presented CFIP series products – CFIP Lumina FODU, CFIP-108 FODU, CFIP Marathon FIDU, CFIP PhoeniX M Split Mount, CFIP PhoeniX Split Mount, SAF FreeMile 5,8GHz MIMO as well as SAF FreeMile 17/24GHz FODU and our newest products Integra and Spectrum Compact. The Board of Directors of “SAF Tehnika” JSC (Reg.No.40003474109, legal address: 24a, Ganibu dambis, Riga, LV-1005, Latvia) informs that it convenes a regular shareholders’ meeting on 29th November 2013 at 10.00 a.m., at “SAF Tehnika” JSC meeting room (24a, Ganibu dambis, Riga, Latvia). 4. Appointment of the auditor for the financial year 2013/2014. Shareholders and their representatives can submit draft decisions regarding the issues of the agenda to be discussed on the shareholders meeting until 8th November 2013 at “SAF Tehnika” administration (Ganibu dambis 24a, Riga, LV-1005) every working day from 9.00 a.m. to 5.00 p.m. Draft resolutions on the issues of the agenda to be discussed on the shareholders meeting will be published on 13th November 2013. Draft resolutions will be available also on company’s webpage www.saftehnika.com, as well as at “SAF Tehnika” administration (Ganibu dambis 24a, Riga, LV-1005) every working day from 9.00 a.m. to 5.00 p.m.
Only persons or entities which are shareholders on the date of record will be entitled to participate in the shareholders’ meeting. The date of record is 21 November 2013. 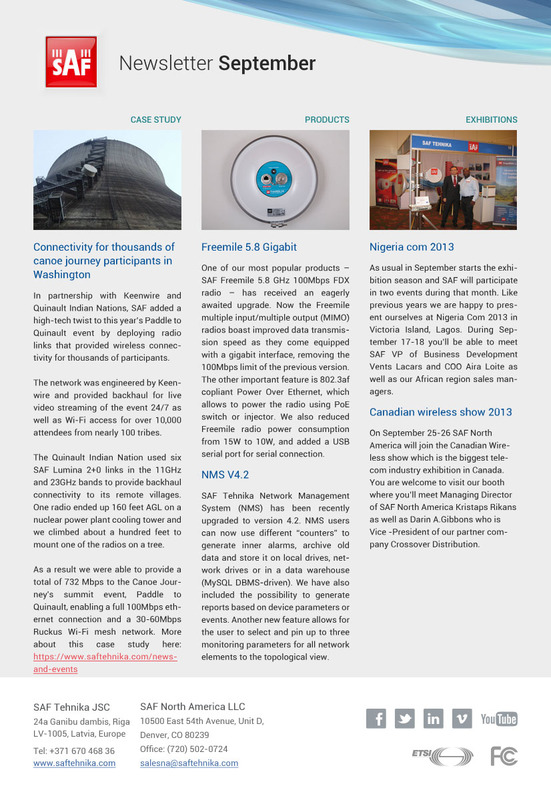 Registration of participants will take place at the venue on the day of the shareholders’ meeting – on 29th November 2013 from 9.30 a.m. until 10.00 a.m.
Click on the image below to read our October's newsletter! On October 2, 2013 „SAF Tehnika” JSC and government institution „The Investment and Development Agency of Latvia” concluded agreement No. L-ĀTA-13-1718 (project No. ĀTA/2.3.1.1.1./13/54/036) regarding implementation of the project "Participation of "SAF Tehnika" JSC in international exhibitions" co-financed by European Regional Development Fund. Project expenses estimate altogether - 90 187.83 LVL. According to the agreement No. L-ĀTA-13-1718 (project No. ĀTA/2.3.1.1.1./13/54/036) concluded on between „SAF Tehnika” JSC and government institution „The Investment and Development Agency of Latvia” of a project „Participation of „SAF Tehnika” JSC in international exhibitions”, On October 2, 2013 the company exhibited at “NigeriaCom 2013” which took place in Lagos, Nigeria. 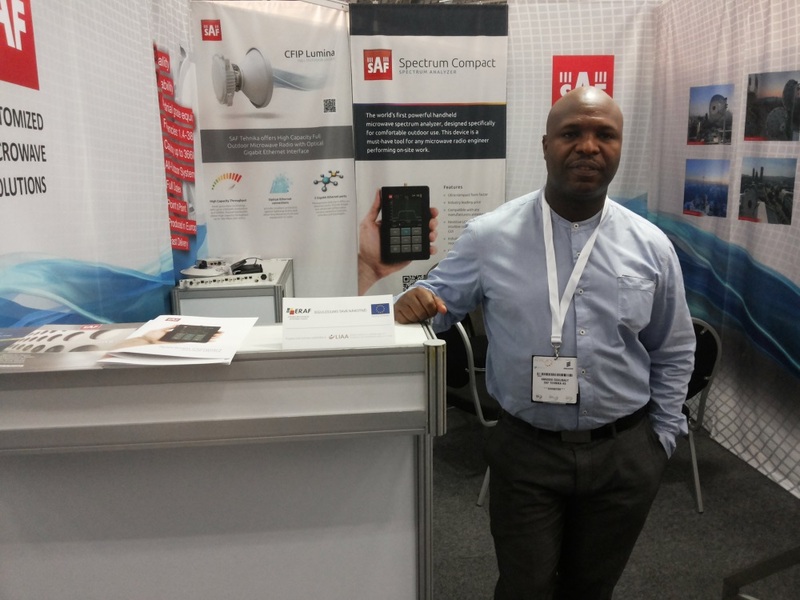 During the exhibition „NigeriaCom 2013” there were presented Spectrum Compact, FreeMile 5.8GHz, CFIP 108 and Lumina product lines. Visitors of „SAF Tehnika” stand were mainly from Africa region, particularly Nigeria. Alpha Omega Wireless is a leading integrator of complete end-to-end wireless backhaul networking technology and solutions. Alpha Omega Wireless provides wireless site surveys, feasibility studies, engineering, spectrum analysis, path calculations, design, wireless installation, equipment sales, radio repair and maintenance, support, troubleshooting, and ongoing management & monitoring of point to point wireless links, point to multipoint wireless systems, WiMax backhaul, LTE wireless communication, Wi-Fi, and wireless mesh. As well as SCADA telemetry radio, wireless video surveillance, and indoor RF. Alpha Omega Wireless works with unlicensed wireless Ethernet bridges and licensed microwave links. SAF Lumina radios have passed tests for seismic resistance and are now approved for deployment in Ukrainian Nuclear power plants and places with high seismic activity. SAF Tehnika (Latvia) together with Ukrainian Technological Process Instrumentation & Control System developer Westron carried out testing of SAF CFIP 11 Lumina radios on compliance with standards ETSI EN 300 019-1-4 and ETSI EN 300 019-1-3 in part of seismic resistance. Test results from Ukrainian Testing and certification center confirmed that SAF Tehnika’s equipment, deployed in Ukrainian Nuclear Power Plants (NPP), supports all the rigid demands imposed on it and is ready to guarantee data transmissions even in extreme emergency situations such as earthquakes. SAF radios are being used for data transmissions to the Crisis Centers of South-Ukrainian NPP in Information Storage System for Design-Basis and Beyond Design-Basis Accident Conditions ("Black Box") that is being implemented by Westron LLC at SUNPP. Westron (Kharkov, Ukraine) specializes in performance of totality of works on Technological Process Instrumentation & Control (I&C) Systems purposed for industrial enterprises, including I&C design solutions, manufacture, tests, deliveries, implementation, and maintenance for nuclear and fossil power plants and various applications in industry. 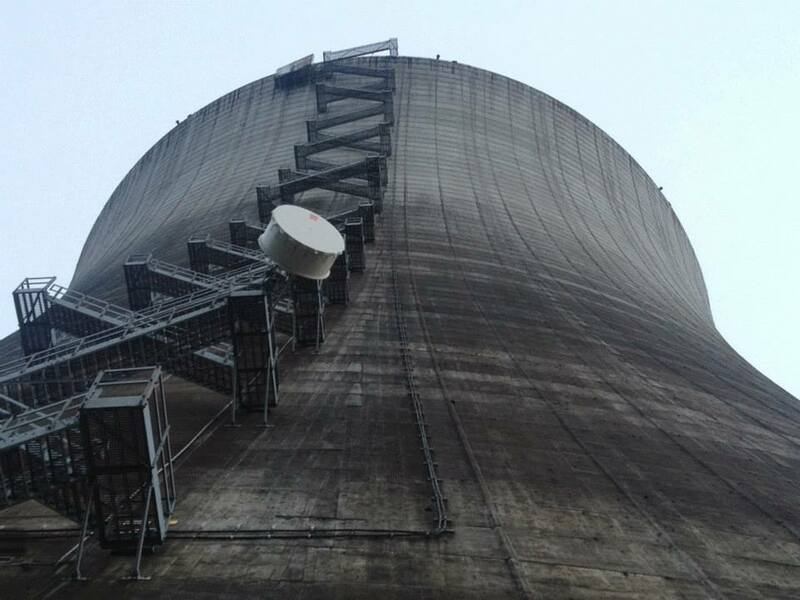 The systems developed and manufactured by Westron operate successfully in all Ukrainian NPPs. Westron performs a considerable scope of works on I&C systems for Units in Ukraine, Russia, Armenia, Czechia, Bulgaria, Sweden, USA, Iraq and other countries. SAF Tehnika is one of the leading global microwave point-to-point radio manufacturers and distributors also specializing in customized user-friendly solutions and services covering all microwave spectrum bands. SAF Tehnika JSC is company with many year experience in delivering highest quality products and services which are being distributed in more than 100 contries worldwide. RIGA, LATVIA and MONTREAL, CANADA -- SAF Tehnika, a leading designer and manufacturer of point-to-point microwave data transmission equipment, and Performant Networks, pioneers in dynamic performance optimization solutions for wireless backhaul networks, have completed interoperability testing using the Performant Router-Free Link Optimization (R-FLO®) solution and SAF Tehnika radio systems. SAF Tehnika JSC informs that on 09.09.2013 an announcement from Koka zirgs LLC (Reg. No. 40103705498) was received informing that on 04.09.2013 the company has purchased 156556 shares (5.27% of share capital) of SAF Tehnika JSC. The announcement from Koka zirgs LLC was submitted by Normunds Bergs, Chairman of the Board, owner of 48.75% share capital of Koka zirgs LCC, meanwhile also the Chairman of the Board of SAF Tehnika JSC. SIA "LEO PĒTĪJUMU CENTRS" ir noslēdzis 2011. gada 11. aprīļa līgumu Nr. L-KC-11-0006 ar Latvijas Investīciju un attīstības aģentūru par projekta "Latvijas elektronisko un optisko iekārtu ražošanas nozares kompetences centrs" īstenošanu, ko līdzfinansē Eiropas Reģionālās attīstības fonds. 2) Līgums par individuālā pētījuma Nr.1.20. „INTEGRA-jaunas paaudzes datu pārraides risinājumi” īstenošanu. SAF Tehnika projektus sāk īstenot no 01.08.2013. As usual in September starts the exhibition season and SAF will participate in two events during that month. We are also glad to announce a few eagerly awaited updates of our products and present a case study about creation of microwave connectivity for thousands of Native americans during their canoe journey Paddle to Quinault. Want to find out more? - Check out our September’s newsletter! SAF Tehnika's (further Group) non-audited net sales for the fourth quarter of financial year 2012/13 were 2.35 million LVL (3.34 million EUR), increasing by 9% compared to the fourth quarter of the previous financial year meanwhile declining by 9% compared to the previous reporting quarter of the current financial year (Q3 FY 2012/13). Revenue generated in European, CIS regions decreased by 21% or 0.2 million LVL (0.29 million EUR) comparing to Q3 FY 2012/13 at the same time posting drop (30%) against the respective reporting quarter of the previous financial year. The regions accounted for 33% from the total Groups’ revenue. Sales in Asia, Middle East and Africa increased by 42% or 0.19 million LVL (0.27 million EUR) from the previous reporting quarter of the current financial year at the same time showing a 36% year-to-year growth. The regions generated 28% from the total turnover of the reporting quarter. Sales in the Americas regions declined by 18% or 0.21 million LVL (0.3 million EUR) compared to the previous reporting quarter of the current financial year while still maintaining positive growth trend by posting a 62% year-to-year growth. The region retained a stable 40% share from the total group’s turnover of the reporting quarter. The Group ended fourth quarter of 2012/13 financial year with a net profit of 14 838 LVL (21 113 EUR), which represents a decrease of 22 919 thousand LVL (32 612 EUR) when compared to respective quarter of previous financial year. Meanwhile the Groups unaudited net loss for 2012/13 financial year’s 12 months was -5 913 LVL (-8 413 EUR). The Group has diversified its portfolio to become a unique market player among the global point-to-point microwave manufacturers, not only providing equipment and managed services, but also providing solution for radio field engineers with the launch of the SAF Spectrum Compact. 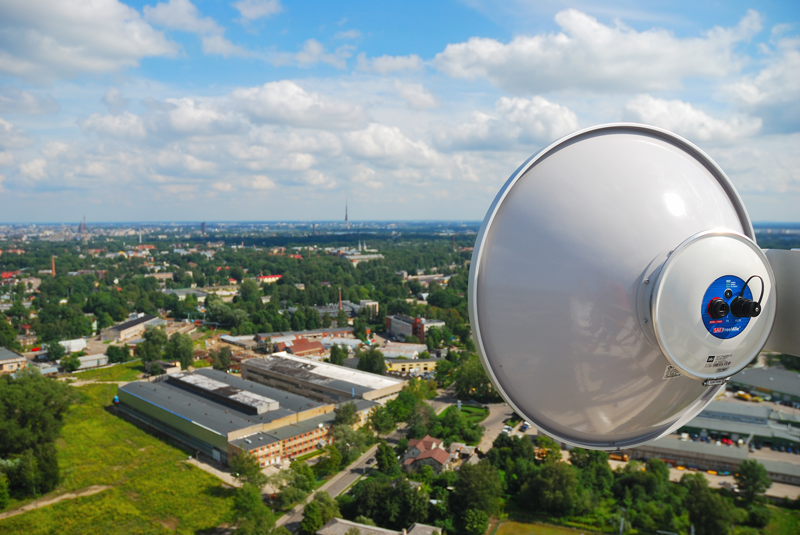 Meanwhile the Group prepares for full market enrollment of the announced Integra product, which is designed to be system optimized for small cell backhaul and other dense urban applications. European microwave radio manufacturer SAF Tehnika is proud to announce that one of our most popular products – SAF Freemile 5.8 GHz 100Mbps FDX radio – has received an eagerly awaited upgrade. Now the Freemile multiple input/multiple output (MIMO) radios boast improved data transmission speed as they come equipped with a gigabit interface, removing the 100Mbps limit of the previous version. The other important feature is a Power over Ethernet, compliant to 802.3af Standard, which allows to power the radio using PoE switch or injector. We also reduced Freemile radio power consumption down from 15W to 10W, and added a USB serial port for serial connection. • Improved throughput for asymmetrical traffic. • Built-in standard active PoE chip complying with 802.3af standard. • Reduced power consumption - max 10W per unit (previously 15W). SAF FreeMile 5.8 is a Licence Free 5.8GHz radio for Ethernet packet data transmission. Making use of ground breaking 2x2 MIMO technology, the SAF FreeMile 5.8 MIMO delivers real aggregated throughput capability of up to 210Mbps combined with high packets-per-second performance. This product enables carrier-class point-to-point capability, ideal for dedicated access or backhaul applications (including VoIP or other small packet applications). SAF FreeMile 5.8 Gigabit presents leading proprietary software mechanisms to set the utmost standard in spectral efficiency. SAF FreeMile 5.8 Gigabit product features an integrated dual-polarized antenna (or 2 N-type connectors for the 5-N product). Product showcases an array of advanced software mechanisms that provide optimal point-to-point connectivity for high throughput, long distance links. SAF’s proprietary FreeMile 5.8 MIMO PTP mechanisms utilize techniques such as Dynamic Time Division Duplexing (TDD) to dynamically allocate bandwidth in the direction needed, thus increasing link efficiency and greatly decreasing the impact that distance has on throughput of the link. SAF Tehnika Network Management System (NMS) has been recently upgraded to version 4.2 which includes an expanded set of useful features and software improvements. NMS users can now use different “counters" to generate inner alarms, archive old data and store it on local drives, network drives or in a data warehouse (MySQL DBMS-driven). We have also included the possibility to generate reports based on device parameters or events. Another new feature allows for the user to select and pin up to three monitoring parameters for all network elements to the topological view. This will make your most important parameters easier accessible. • Added counters for threshold processing which enables the NMS server to trigger inner alarms and send SNMP traps to higer-level NMS using North-bound interface, notifications in form of SMTP messages, SMS messages or push notifications to your Mobile NMS Client. • Automated data archiving and deletion from the NMS database for data, that is older than the user-set period of time. Archived items may be stored in database, CSV files and SQL scripts. • Generation of reports based on device parameters or events. Reports can be generated for the network elements selected by monitored segment (region/system) and device model. • Possibility to pin up to three most important monitoring parameters to network elements in topological view. SAF NMS is an integrated quality toolset consisting of hardware and software, used to monitor and administer a network, made of SAF designed microwave radio equipment, locally and remotely in convenient and user-friendly manner. SAF NMS is also available as a mobile application for Android smartphones. It is a handy and feature-rich tool that provides enhanced realtime overview of the actual equipment and network status via instant push-notification service. 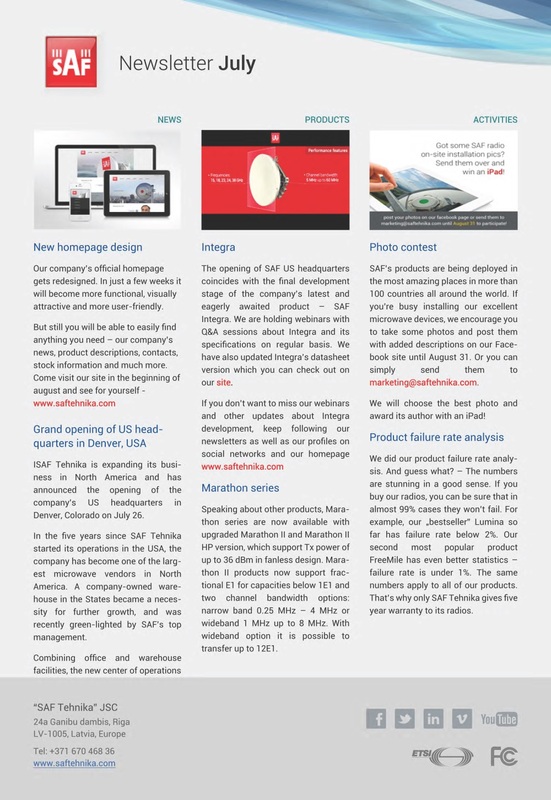 SAF Tehnika, the Latvian-owned manufacturer of carrier-class point-to-point microwave radios, is expanding its business in North America and has announced the opening of the company’s US headquarters in Denver, Colorado on July 26. 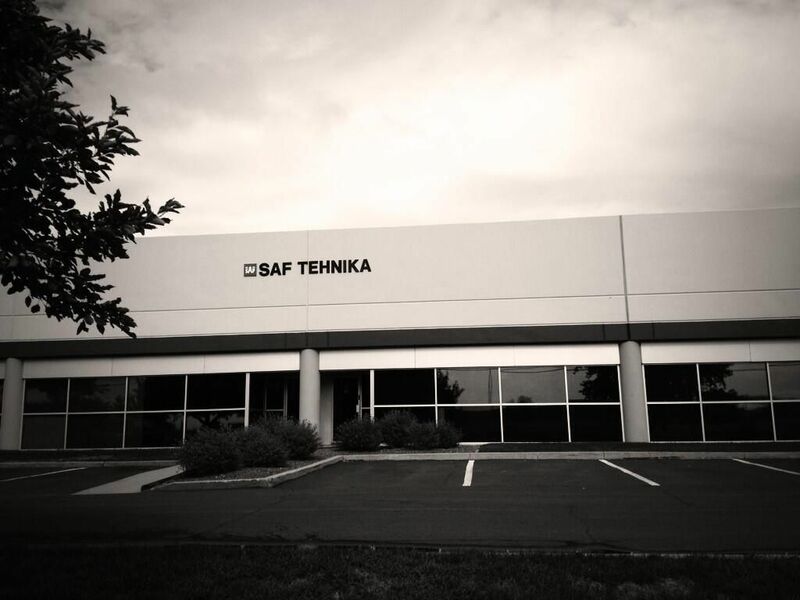 In the five years since SAF Tehnika started its operations in the USA, the company has become one of the largest microwave vendors in North America. A company-owned warehouse in the States became a necessity for further growth, and was recently green-lighted by SAF’s top management. Combining office and warehouse facilities, the new center of operations will help SAF improve its logistics as well as customer care in general, and generate feedback to the company’s headquarters and factory in Latvia, Europe. 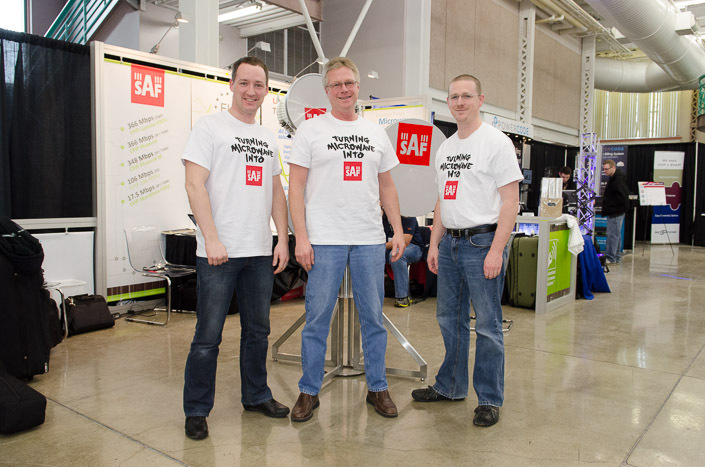 SAF’s US sales team will now be better equipped to help their partners and customers throughout the region. SAF Tehnika offers a wide range of products for wireless communication and data transmission as well as network monitoring, with the most popular among them being the Lumina and Freemile radios, which guarantee uncompromised voice and data transmission, and the Spectrum Compact – a unique device created for microwave frequency band management. The opening of SAF US headquarters coincides with the final development stage of the company’s latest and eagerly awaited product – SAF Integra. Designed by the best Latvian radio engineers and programmers, Integra matches the highest industry standards, at the same time differing from rival products with a number of innovative features. This product was developed primarily with the end-users in mind, ensuring that software installation and maintenance tasks are as simple and user-friendly as possible. The Integra is cased in an ultra-light and technologically advanced material, integrating the radio part with an antenna and mounting hardware. According to SAF Tehnika Sales and Marketing Vice president Edgars Ricevs, “We are convinced that with the help of Integra SAF will acquire a new customer segment, increasing our global marketshare”. SAF Tehnika is a unique designer and manufacturer of point-to-point microwave data transmission equipment. Located in Northern Europe, SAF Tehnika managed to acquire and consolidate valuable locally available intellectual resources of the microelectronics industry and spread its presence to more than 100 countries all over the world, covering all relevant market segments within just a decade. On July 1 SAF Tehnika was recognized by the Latvian exporting brand support movement The Red Jackets as one of the 25 best exporting Latvian companies. 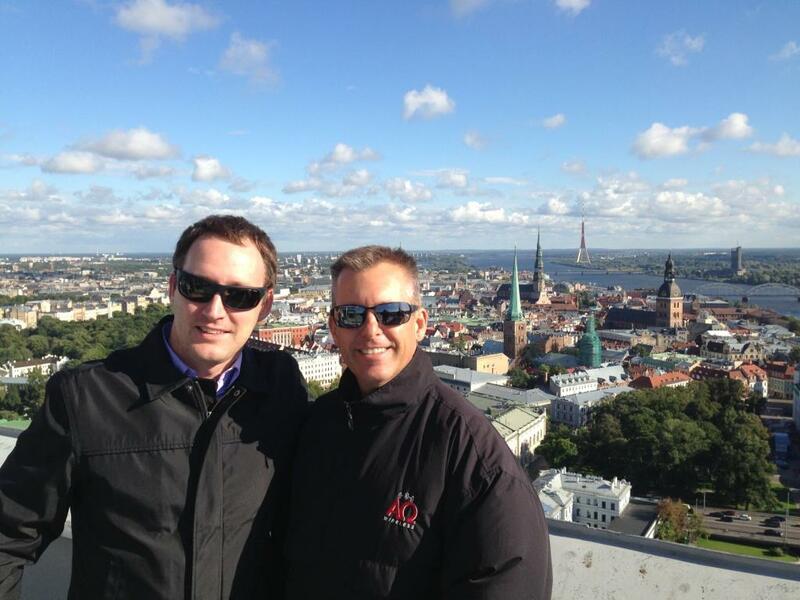 The company also trades its stock in the official list of Baltic stock Exchange market NASDAQ OMX Riga. On July 19, 2013 the Supervisory Council of SAF Tehnika JSC elected the existing Board of Directors to continue to be effective for another term. Normunds Bergs remains as the Chairman of the Board, Didzis Liepkalns and Aira Loite continues to act as Members of the Board. The previous term of the Board would expire on July 20, 2013. On 8th July 2009 JSC "SAF Tehnika" and state agency "Investment and Development Agency of Latvia" concluded agreement No.L-JPI-09-0002 (project No.JPI/2.1.2.2.1/08/01/0002) on the implementation of a project "Development of solutions for design of new-generation wireless digital microwave radio products", which is co-financed by European Regional Development Fund and Latvian national budget. Project provides a co-funding for a scientific research performed by JSC "SAF Tehnika" with the aim to develop solutions for the improvement of microwave radio efficiency and for the reduction of production costs, as well as for more rational utilization of materials. The planned duration of the execution of the project is 18 months. On the 18th of July, SAF Tehnika JSC has signed a project implementation agreement No. L-JPR-11-0062 (Project No. JPR/2.1.2.2.2/11/02/013) with Latvian Investment and Development Agency (LIDA) for the project "The start of product CFIP Lumina mass production", which is co-financed by European Regional Development Fund. Total project cost is 97 thousand LVL. Within the framework of the project, the company will start the mass production of its latest product CFIP Lumina - high capacity data transmission equipment using fully external equipment model, whose hybrid manufacturing technology helps to use much more sophisticated measurement, control and testing tools during the entire manufacturing process and which are crucial to correspond to standarts of ETSI. Within the framework of the project, the company is going to buy and deploy equipment for the final part of the production cycle to control manufacturing process and quality. 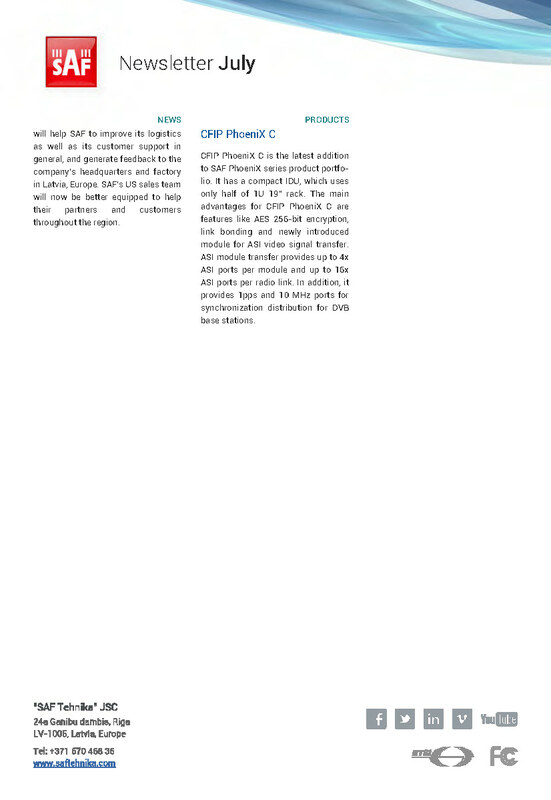 CFIP Lumina systems are intended for Gigabit Ethernet backbone applications delivering up to 366 Mbps per radio. 2+0 aggregation is available for higher bandwidth user needs. Both single or dual, electrical and fiber optical interface versions are available, as well as hybrid version with 1 optical and 1 electrical port. According to the agreement No .L-ĀTA-12-1169 (project No. ĀTA/2.3.1.1.1./12/42/011) concluded on between „SAF Tehnika” JSC and government institution „The Investment and Development Agency of Latvia” of a project „Participation of „SAF Tehnika” JSC in international exhibitions”, on May 21 – 23, 2013 the company exhibited at “CTIA 2013” which took place in Las Vegas, USA. During the exhibition „CTIA 2013” there were presented CFIP and Freemile product lines of „SAF Tehnika”, as well as newest products of the company – handheld microwave spectrum analyzer Spectrum Compact and the SAF Integra - ultra light, energy efficient and powerful all-in-one carrier-grade microwave data transmission system. The biggest part of “SAF Tehnika” booth #2846 visitors at Tower Technology Summit Pavilion was existing and potential clients from North and Central America. 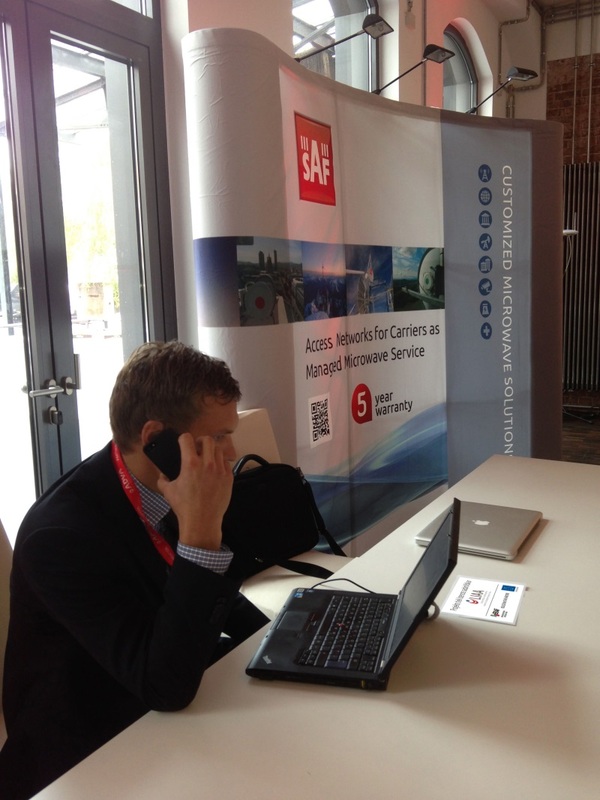 The biggest attention was toward SAF Integra as innovative solution in microwave industry. SAF Tehnika JSC (NASDAQ:SAF1R), one of the pioneers of compact full outdoor point-to-point microwave technology today announced the launch of Integra – ultra light, energy efficient and powerful all-in-one carrier-grade microwave data transmission system. Integra is a natural step forward in the evolution of user friendly full outdoor microwave systems design. Integration of next generation microwave radio with high (ETSI Class 3) and super high (ETSI Class 4) performance antennas into a single unit means less time spent on the installation site, better availability and reliability of the link even in densely served areas, all of which translates into a lower total cost of ownership. The new Integra exemplifies an outstanding return on smart engineering - the synergy of high competence in radio electronics and materials science. Read more about Integra in SAF Tehnika web page or meet the whole SAF North America team at CTIA 2013 (Tower Technology Summit Pavilion - booth #2846) in Las Vegas, Nevada, USA on May 21st through 23rd. You can see Integra video in SAF Youtube channel. SAF Tehnika JSC is an ISO certified wireless data transmission equipment manufacturer. The company’s products are produced in Latvia, European Union, and deployed in over 100 countries worldwide. SAF Tehnika has been listed on NASDAQ OMX Riga since 2004. SAF Tehnika's (further Group) non-audited net sales for the third quarter of financial year 2012/13 were 2.57 million LVL (3.66 million EUR), increasing by 20% compared to the third quarter of the previous financial year. Meanwhile the sales remained on the same level only posting a slight 4% decrease when compared to the previous reporting quarter of the current financial year (Q2 FY 2012/13). The Group reached the financial results by continuing to supply existing projects as well as attracting new business in the strategic markets. The European, CIS region retained stable sales levels and posted a 8% growth comparing to Q2 FY 2012/13 at the same time growing significantly (20%) against the respective reporting quarter of the previous financial year. Due to lower activity in existing projects and political instability in markets where Group is present the revenue from Asia, Middle East and Africa region decreased by 31% or 0.2 million LVL (0.29 million EUR) from the previous reporting quarter of the current financial year, meanwhile also showing a 38% year-to-year sales drop. Consequently the region generated only 18% from the total turnover of the reporting quarter, opposed to 34% in the respective reporting quarter of the previous year. The Americas region which already previously proved to be a strategic region continued to grow both for CFIP Lumina product sales as well as further expanding FreeMile product line posting a combined growth of 36% or 0.3 million LVL (0.43 million EUR) compared to the previous reporting quarter of the current financial year. Consequently the region retained a 42% turnover share from the total group’s turnover of the reporting quarter. The Group decreased the allowances for bad debtors and made financial gains from favorable USD to LVL, foreign exchange rates positively contributing to the reporting quarter’s profits. The Group ended third quarter of 2012/13 financial year with a net profit of 270 thousand LVL (384 thousand EUR), which represents an increase of 245 thousand LVL (349 thousand EUR) when compared to respective quarter of previous financial year. The Group has always focused on responding to customer and market requirements. Following an extensive R&D activity the Group prepares to launch the first products from a new generation product line supporting extended functionality that addresses many requirements of the existing and potential Group’s customers. Throughout the remaining year Group is determined to complete the whole product line. The Group will continue to focus on strategic niche markets offering current and new products, customized solutions for specific clients as well as launching promotions for the new product line. Additionally the Group will continue developing it’s managed services offering. The Group remains financially stable and with positive outlook for the next operating periods. Meanwhile due to market competition pressures and dependencies on customer and market activities, the Board of the Group avoids giving any forward-looking sales and financial result statements. Projekts tiek īstenots darbības programmas „Uzņēmējdarbība un inovācijas” papildinājuma 2.3.2.3. aktivitātes „Klasteru programma” ietvaros, ievērojot 2012.gada 12. septembra Līgumu par projekta īstenošanu Nr. L-KAP-12-0002, kas noslēgts starp LEtERA un valsts aģentūru „Latvijas Investīciju un attīstības aģentūra”. According to the agreement No .L-ĀTA-12-1169 (project No. ĀTA/2.3.1.1.1./12/42/011) concluded on between „SAF Tehnika” JSC and government institution „The Investment and Development Agency of Latvia” of a project „Participation of „SAF Tehnika” JSC in international exhibitions”, on March 5 – 9, 2013 the company exhibited at “CeBIT 2013” which took place in Hanover, Germany. During the exhibition „CeBIT 2013” there were presented CFIP and Freemile product lines of „SAF Tehnika”, as well as microwave spectrum analyzer Spectrum Compact and the newest product of CFIP Marathon 2. The biggest part of “SAF Tehnika” booth #С32 at hall 011 visitors was existing and potential clients from Europe and nearest regions. Riga, Latvia, 2013-03-06 17:12 CET (GLOBE NEWSWIRE) -- SAF Tehnika JSC informs that as of March 1, 2013, Janis Ennitis resigned from SAF tehnika Board along with leaving the position of the company's Vice President Sales and Marketing. Remaining Board members Chairman of the Board Normunds Bergs, Vice-Chairman of the Board Didzis Liepkalns and member of the Board Aira Loite continues to perform their duties. In accordance with Paragraph 14 of Section 59 of the Law of Financial Instruments Market, SAF Tehnika JSC (hereinafter – the Company) informs that it became aware of liquidity issues of the Company’s partner in Brazil who had purchased SAF equipment in order to implement the project of building up the Brazilian TV broadcast network (hereinafter – the Partner). As the result, the Partner has not been able to meet the conditions for TV broadcast network construction project implementation, and the customer has terminated the agreement. The total amount of the SAF equipment delivered to the Partner (and not yet paid) is 578,000.00 USD, and the payment due date is August 2013. SAF Tehnika had acquired Latvian Guarantee Agency’s export guarantee for this transaction which, according to the conditions of the export guarantee agreement, will cover part of the overdue amount in case if the partner fails to meet his obligations. SAF Tehnika announces that as of 1 March this year, Edgars Ricevs, at present CEO of Stream Networks, will join SAF Tehnika as the company's Vice President Sales and Marketing. Within a month, Edgars Ricevs will also occupy a position of a Board Member, thus replacing the former company's Vice President Sales and Marketing Janis Ennitis whose leave from the company is related to an opportunity of developing a private business. "Respecting the decision of Janis Ennitis to take on a new challenge in his career I am convinced that in the person of Edgars Ricevs SAF Tehnika has been joined by a knowledgeable manager with most extensive experience in the sector of innovative telecommunication technologies, which will be a great asset for the company," stressed SAF Tehnika Chairman of the Board, Normunds Bergs. At the same time SAF Tehnika confirms that the expected changes in the company's management are not related to the changes in the company's strategy of the product development and its international operations. The duties of Edgars Ricevs at SAF Tehnika will include sales and marketing management by strengthening those activities worldwide, investigating new opportunities and developing managed services business in North America. Edgars Ricevs currently is performing as a CEO of SIA Stream Networks (since August 2008) – wireless broadband access provider in Northern Europe. E. Ricevs was also a COO and CTO of pan-Baltic alternative carrier Norby Telecom (March 2007- August 2008) and, he also was holding a CEO position at SIA Telecentrs (April 2002 - August 2008). Within the period from February 1996 to March 2002 he performed the duties of the Head of Microwave department for Microlink Latvia. E. Ricevs holds bachelor degree in computer science from Ventspils University College (2004-2006). According to the agreement No .L-ĀTA-12-1169 (project No. ĀTA/2.3.1.1.1./12/42/011) concluded on between „SAF Tehnika” JSC and government institution „The Investment and Development Agency of Latvia” of a project „Participation of „SAF Tehnika” JSC in international exhibitions”, on January 29 – February 1, 2013 the company exhibited at “Animal Farm 7” which took place in Salt Lake City, Utah, USA. 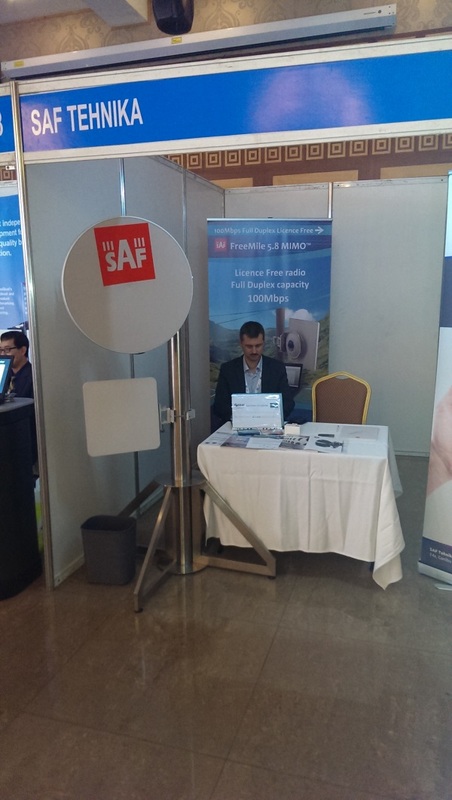 During the exhibition „Animal Farm 7” there were presented CFIP and Freemile product lines of „SAF Tehnika”, as well as microwave spectrum analyzer tool. The biggest part of “SAF Tehnika” booth #27 visitors were from North America region. Riga, Latvia, 2013-02-06 15:20 CET (GLOBE NEWSWIRE) -- SAF Tehnika's (further Group) non-audited net sales for the second quarter of financial year 2012/13 were 2.69 million LVL (3.83 million EUR), increasing by almost 10% compared to the second quarter of the previous financial year at the same time posting an 40% increase from the previous reporting quarter of the current financial year (Q1 FY 2012/13). The financial results reflect Groups ability to maintain regular sales activities together with acquiring new mid-to-large size projects. Asia, Middle East and Africa region continued to show improved results with revenue growing by 25% or 0.13 million LVL (0.2 million EUR) from the previous reporting quarter of the current financial year, meanwhile also showing a 21% year-to-year sales improvement. 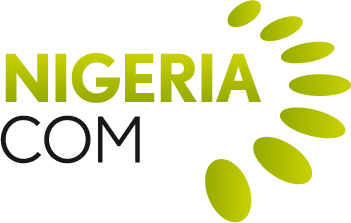 Consequently the regions strengthened its strategic importance by contributing 25% from the total turnover. As the European, CIS region regained market activity the sales in the region grew by 60% against Q1 FY 2012/13 however still not reaching the previous average levels Group generated in the previous reporting quarters with year-to-year turnover decreasing by 19% or 0.21 million LVL (0.31 million EUR). The periods’ financial results were directly affected by an increase in operating costs. Due to change in government’s conditions for financing development projects for competence centers the Group decided to suspend the ongoing development projects in “LEO Petniecibas Centrs” and consequently will have to absorb additional development costs amounting to 72 thousand LVL (102 thousand EUR). Increased expense related to sales and marketing activities also affected the bottom line. Furthermore, the Group suffered from unfavorable USD to LVL, foreign exchange rates which made a negative impact on the reporting quarter’s profits. The Group ended second quarter of 2012/13 financial year with a net loss of 170 thousand LVL (243 thousand EUR), which represents a decrease by 238 thousand LVL (339 thousand EUR) when compared to respective quarter of previous financial year where company posted profit. The Group’s current main focus is to progress on the ongoing R&D projects of new generation product that will support both the functionality of currently existing products and will be possess additional advanced features. It is planned that the product will be introduced to the market at the beginning of summer 2013. The Group plans to expand in managed services field and will sharpen its focus on niche markets and customers to ensure development and technical support resources are channeled to key areas. Notwithstanding the financial results of the reporting period, the Group remains financially stable and confident to withstand periods of lower business activity. Due to intense competitive pressures and general decrease in spending of businesses consuming telecommunication equipment, the Board of the Group does not assume any specific predictions of sales and financial results of the next reporting periods.